Decorate your car with these patriotic antenna heads painted in the color of your country’s flag. These would also look great for graduation, if you can find a graduate hat in your local craft store. Thanks to Mary at work for this idea. Paint the hat in your choice of design. Follow our stars and stripes design if you live in America. Use another patriotic motif if you live elsewhere; for instance, Canadians could paint a red maple leaf in the center of the hat. Paint the styrofoam ball in a flesh tone. Let dry and paint on some lips. Spray the painted hat and styrofoam ball face with a matte finish sealer and let the sealer dry. Use a strong glue to glue the hair on top of the ball, then glue on the hat, making sure you cover the seams of the hair. Add the eyes and glasses, then glue on a bow to match the hat, with long tails to fly back in the breeze. 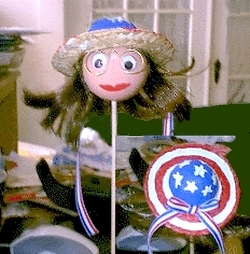 When all is dry, glue the patriotic head to your car antenna. Enjoy!